I was recently asked a few questions by one of the adventure magazines on how I prepare and take care of camera equipment, food and communications on long expeditions. For all of you heading to remote areas of the planet here is some of the lessons I learnt the hard way. As a photographer, how do you prepare your material for an expedition, do you take several cameras (compact or reflex) tons of extra batteries, some solar panels… Do you have a few tips ? I’d also heard stories of lenses getting damaged due to the change in temperature and humidity when taken inside the tent so I kept my cameras in the cold, in their pelican box at all times when they were not in use. I also took the batteries out when not in use and kept them in a zip lok bag in my chest pocket several layers away from the cold. To charge all the electronics we took 2 Goal Zero systems, 1 Yeti 400 and 1 Sherpa 100 combined with 2 x 20 W solar panels. At 71 degrees North in April with both panels daisy chained we harvested a meagre 4-12 Watts from the sun. i.e. the panels were pulling 10-25% of their rating. Get foldable panels or roll up panels if you are travelling so they don’t get broken. If I was travelling large distances again in a remote area then I’d take a Sherpa 100 and Sherpa 50 system as the Yeti 400 felt like a brick at 15kg. You have to calculate how many Watts you will need – a hard drive laptop uses nearly twice as many Watts as a solid state drive laptop. Top tips: redundancy is the key, plan for everything breaking or getting lost and take several memory cards. Back everything up. Make sure you don’t just have one essential cable or tripod mounting plate! Avoid moving your expensive kit from cold to warmer, humid environments and vice versa and remove ice crystals from the lens by thawing them with alcohol – simple rubbing them off will scratch your glass! For the food, how do you plan for food supply ? Do you think in terms of calories per day, do you try to have a good varieties of choice, only freeze-dried…. For the big expeds I plan food on calorie consumption per day. Baffin was based on 6000 kcal/day intake with the main meals being freeze dried food supplemented with snacks. A lot of calories were spent combating cold – we had 1200 fill -88C sleeping bags and Exped down mats and I was still wearing 6 or 7 layers at night. We had to take freeze dried food to Baffin because our 7 base camps were over 240 km apart and we each started out with 110 kgs to haul. For trips where we are not travelling then I try and get a high level of normal food but it depends on how harsh the environment is – cooking in -35C is a chore rather than a pleasure! For snacks I go for largest variety of nuts, chocolate, biscuits, sweets and dried fruit. Its also nice to take some powdered deserts that can be made with water. After 35 days, covering 240 km and climbing 20200 m vertical I had lost 15% of my body weight which was primarily muscle. That said it would be hard to eat much more but when you are on the trip of a lifetime surrounded by stunning lines , 24 hour daylight and good weather its hard to sit still. Variety is key and its better to have too much than too little. Beef jerky was by far our most favourite snack and our bodies just craved protein. Take water bladders and keep them insulated in a sleeping bag. The down Exped mats will insulate you well from the cold ground and lower calorie consumption. Combine with inch thick foam mats just incase you get a puncture thats not repairable. Eat every moment you have time and at night make sure you eat some fat as you will sleep warmer. We put a spoon of butter in hot water before bed! For communication, do you care about it ? Do you try to have a satellite phone or a radio ? The level of comms is dependant on location and mobile phone coverage. Out side mobile coverage you have to determine if a cheap 2 way VHF radio will enable you to communicate with rescue services or if a satphone is the only method of comms. Satphones can be rented at reasonable rates, for trips longer than 30 days it will be worth buying one. Iridium satphones are more expensive but are mandatory for the North Northern Hemisphere whereas cheaper Thuraya satphones will work in Europe and Asia. We also have a satellite texting device made by InReach which is a cost effective way of texting your sponsors from the farthest corners of the Earth with Twitter updates. Always have the emergency / help numbers stored as you never know when they will be needed. 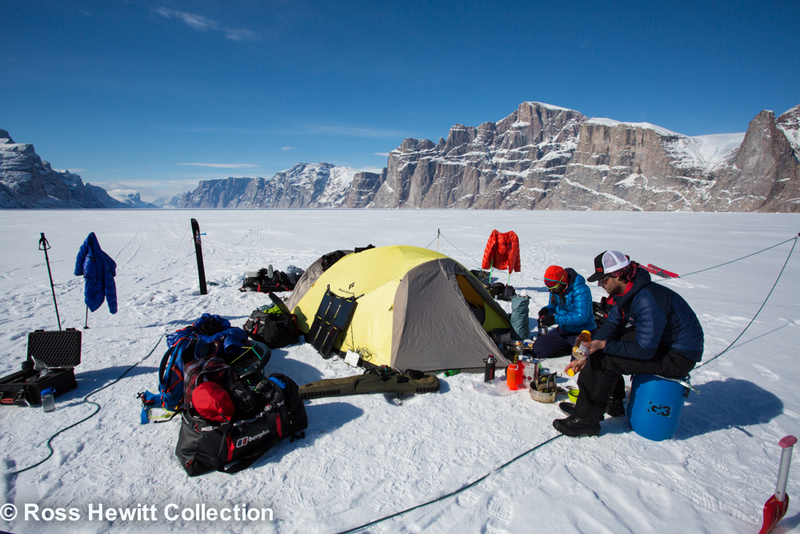 This entry was posted in Expeditions & Trips and tagged Baffin, camera care, camera care in remote areas arctic, charging, expedition food, Expeditions, food, freeze dried food, Goal Zero, Pelican cases, photography, solar panels by Ross Hewitt - Skiing, Climbing, Photography. Bookmark the permalink.